Designed as a sanctuary for young professionals to enjoy a healthy way of life, this garden features multiple spaces for exercise, relaxation or entertainment with family and friends. 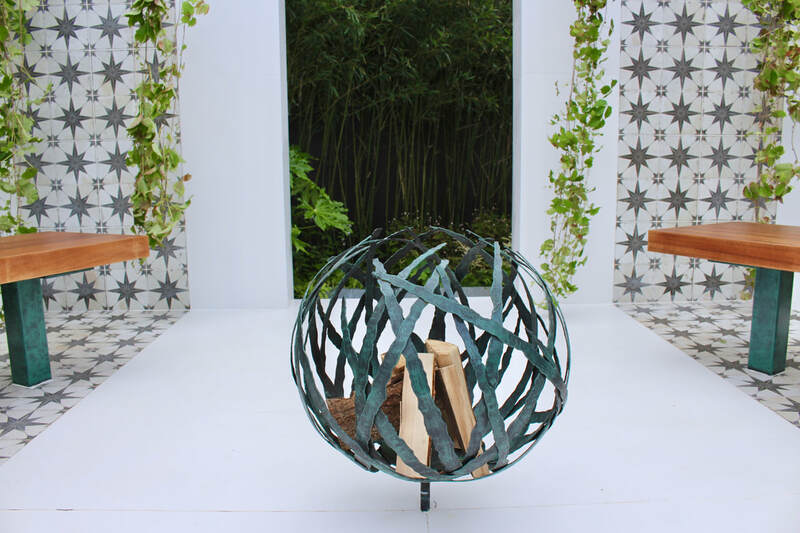 A garden designed for to create a sanctuary to escape to and get lost within the space. The viewer is taken to a very calm space that creates a feeling of relaxation. Water was the central element and planting and contemporary hardscapes surround the pool. This garden was transformed into a garden for entertaining and relaxing in the heart of Dublin city. A young client wanted a garden to enjoy with his friends for cooking and socialising. This garden has a water feature as a centre point with a great display of lighting at night. With a contemporary styled brief and intentions for a reasonably low maintenance plan the garden was designed for modern living. The clients were very pleased with the result and enjoy the garden as an extension to their home. 'Dublin City Garden' in Dublin 6. This garden was transformed into a usable stylish city garden from an overgrown cluttered space. The garden now compliments the clients lifestyle are they are very happy with the end result. Kevin was awarded the prestigious prize of the overall winner at this years 'Bloom In The Park Festival', Irelands largest gardening event. The 'Renault ZOE: City Life Garden' theme aimed to promote plants in cities. The garden featured many design elements and wide variety of plants. Planted roofs, a vertical planted wall, steel sculptures, white concrete elements and an electric car to promote ‘Urban Greening’. 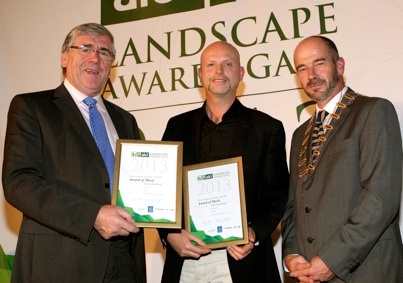 Kevin Dennis Garden Wins a 2013 National Award for a Garden Project completed in Raheny. The award was presented to Kevin Dennis by Minister Tom Hayes on the 18th of October at the National Award Ceremony in Bewleys Hotel Ballsbridge. A Egyptian marble terrace over hanging a natural water way surrounded by a selection of trees. 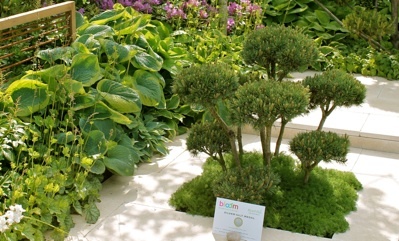 Trees included were bonsai pines, table top 'London planes', pleached Limes and river Birches. 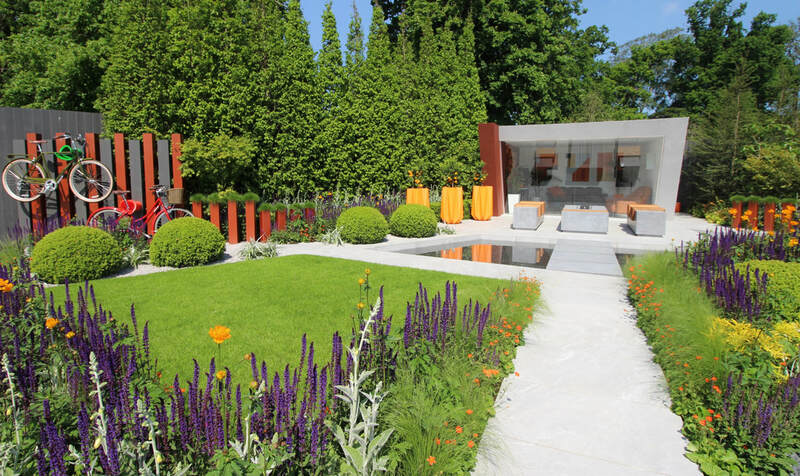 This garden was rewarded a prestigious ‘Silver Gilt’ award at this years Bloom festival in the Phoenix Park. We enjoyed a great weekend and the public reaction was great towards our show garden. Peter O Toole and founding member Peter O Brien. ‘We are delighted that the ALCI has again highlighted the quality of our work. We are looking forward to another good year in 2013’ said managing director Kevin Dennis. The awards were presented on the 21st of October at a gala evening in the Mullingar Park Hotel by Shane McEntee, the Minister of State at the Department of Agriculture, Food and marine with special responsibility for Horticulture and ALCI president Keith Crawford. 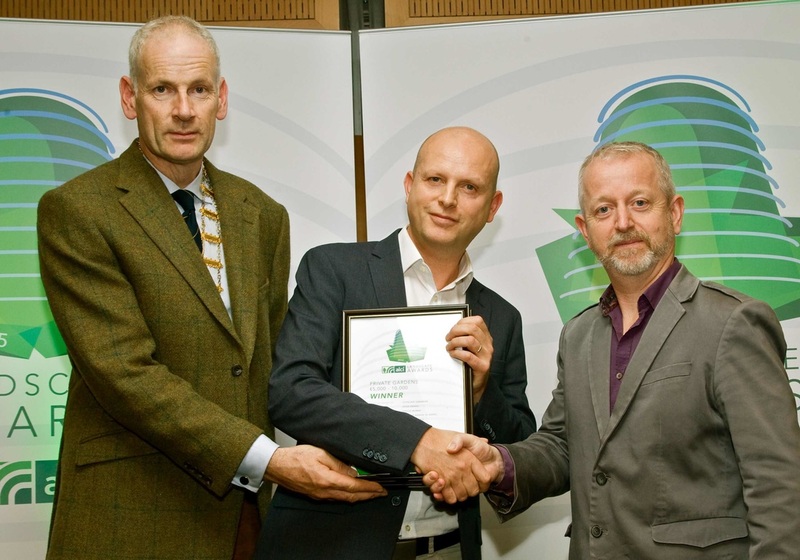 Garden designer Kevin dennis won an award for a project completed at the Central Remedial Clinic (CRC) in Clontarf. 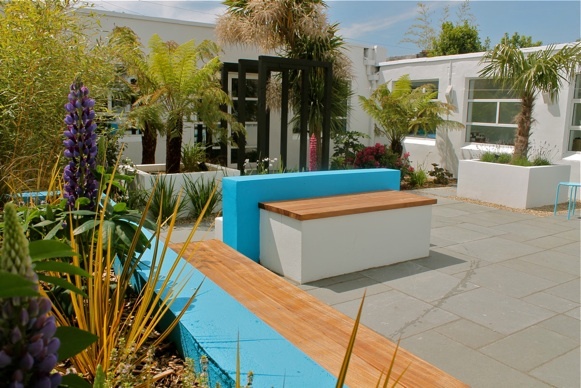 A sensory garden for disabled children at the CRC school which is wheelchair accessible and s a vibrant place for the children to enjoy all the elements of touch, sound, smell and vision. 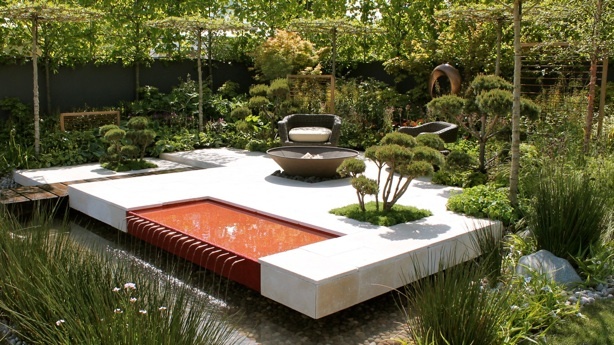 Kevin Dennis wins an award in a private gardens category for 2010. Presented by by Michelle Gildernew Northern ireland minister of Agriculture and rural development and ALCI president Keith Crawford in the Slieve Donard Hotel Newcastle county Down. A garden on Hope Avenue Dublin 3. A ideal garden for entertaining and relaxing. 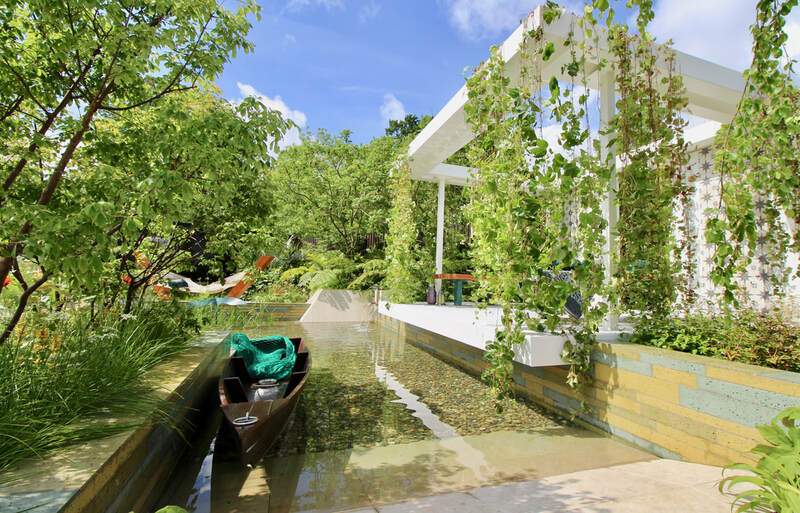 Limestone paving, built-in wooden seating, circle lawn, tropical style planting and a contrast of deep and bright colours make this garden a special place.